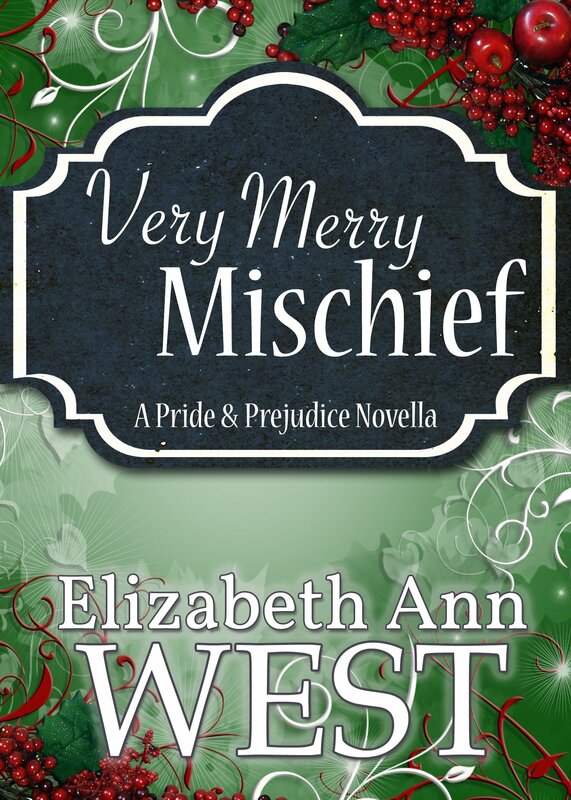 I was debating on what to read for this Christmas time, as I have not a habit of reading season stories, until I spotted “ Very Merry Mischief” in Amazon. The length and premise sounded perfect, so I bought it and now I feel I have to recommend it to everyone. What if an unexpected event prevented Mr. Darcy from returning to Hertfordshire after Bingley’s proposal to Jane Bennet? What if he never attended the Bingley’s wedding? And what if Mr. Darcy never knew of Lady Catherine’s visit to Elizabeth and feared she would only accept him out of gratitude? What if he never returned? As Mr. Darcy never came back to Hertfordshire, Elizabeth believed he was too ashamed of Lydia’s behaviour and Wickham’s connection to make her another offer, With this in mind, she never attempted to contact or even encounter him either, and so it was they spent an entire year without seeing or hearing from each other. On the following Christmas, the Bingley’s are invited to Pemberley and take with them the two “spinster” sisters residing with the family at Netherfield: Elizabeth Bennet and Caroline Bingley. The first scene described in this novella is the trip the four of them make to Pemberley, and we get a glimpse of what it would be like to have Elizabeth and Caroline Bingley living together under the same circumstances: both unmarried, without any suiter or Mr. Darcy. It was very funny to picture this. It made me wonder, and my imagination began to visualise their day to day interactions. Can you imagine how these two would tolerate one another? Can you imagine them spending day after day together in the same parlour? I can, and find it incredibly amusing! When arriving at Pemberley, Elizabeth sees Anne de Bourgh and believes she is married to Mr. Darcy. This of course, leaves her in a miserable state, as she believes the only man she will ever love is completely lost to her. But of course, that never happened, and this is where the true romance starts. I liked their interactions and the way they can communicate with one another in a private way even when the room is full of people. I always like when they use references to books both read to transmit a certain thought they cannot publicly admit. It transmits a sense of connection and intimacy that I’m very fond of. Elizabeth Ann West has clearly made me grow a fondness for novellas that did not exist before. This one is another adorable short story, perfect for a Christmas time. I’m sure everyone who celebrates Christmas is quite busy this time of the year, but this novella has exactly the right length to appeal to everyone in this season. It is amusing, diverting, romantic, well written and it will not take a reader more than 3 hours to read it. It’s perfect for when you feel the need to sit back and relax a little after all the Christmas preparations. Rita, you make this one sound good enough to squeeze into my holiday madness!! Thanks for the interesting review and enjoy your holidays! I’m with Claudine. You’ve got me convinced that I need this one. It sounds perfect for a short holiday read. I love the premise of them not seeing each other for a whole year and then coming together with the Bingleys for Christmas. Merry Christmas! And thank you so much Rita for reading and reviewing!!! Anyone who wants to try novellas can email me at writer@elizabethannwest.com and I will send you a file for Amazon or other ereader. 🙂 I fell in love with reading serials, series, and novellas because I like to read books all in one setting and have less and less time these days. HUGS everyone, and thank you again. This totally made my week!!! !